Jay Ajayi was trashed after his trade to the Eagles. He ended up winning a Super Bowl. Sometimes you interview an athlete, and the athlete sounds so bold and honest and outspoken, and you walk away thinking, Man, I got some terrific quotes there. And then you press PLAY on your digital recorder, and you find 11 minutes of unusable fluff. Wait a second. Back up. Change "sometimes" to "most of the time." Jay Ajayi is the other kind of athlete. His lilting British accent tends, in the moment, to muffle the impact of his words and distract you from their content. It's only when you re-listen to his comments that you appreciate the relative substance of what he said. Take Wednesday, for instance. The Eagles had finished practice, and Ajayi was sitting on a stool in an empty locker room at the NovaCare Complex. He had rushed for 62 yards, two touchdowns, and a two-point conversion last Thursday, accounting for 14 of the Eagles' 18 points in their victory over the Falcons, even though coach Doug Pederson, because Ajayi has been nursing a foot injury, had eased him into the game by not giving him any carries in the first quarter. Thursday was Ajayi's 11th game for the Eagles, regular-season and postseason, since they acquired him in a trade with the Miami Dolphins last October. At the time, there was reason to wonder whether the trade would work out for the Eagles, mostly because there were reports out of Miami that Ajayi (a) had found himself in coach Adam Gase's doghouse because Gase thought him selfish and immature, (b) the Dolphins weren't willing to make a long-term commitment to a running back who had torn his right ACL in college and missed significant time with knee problems in the NFL, and (c) all of the above. Source tells me Ajayi extremely combative with Dolphins coaching staff in recent weeks. Verbal confrontations. 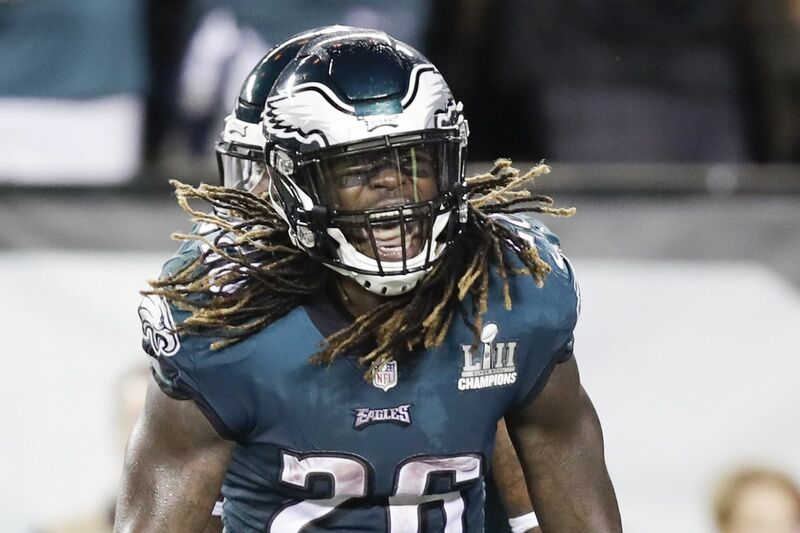 Over those 11 games, though, Ajayi has gained 654 rushing yards, averaging a strong 5.1 yards per carry; caught 16 passes for another 161 yards; scored four touchdowns; helped the Eagles win Super Bowl LII; and caused no apparent conflict between himself and his coaches and teammates. So, he was asked, considering what has happened since the trade, was all that criticism unfounded? "A lot of the stuff that was leaked was by unnamed sources," Ajayi said. "The people weren't even brave enough to put their name behind it, behind the quotes they were saying. I look at that as a joke. I don't even take it seriously. For me, it was just going to be myself and be a great teammate like I know I am and let them see who I am as a player and a person, and they can see for themselves who I am." Did he want to prove to the Dolphins that they were wrong about him? "Not many people can say they get traded midseason and end up winning the Super Bowl. That wasn't what I had planned when I started off the season as a Dolphin. It's tough to get traded, and in my trade, as public as it was, with a war of words, they were trashing me to the world. That kind of stuff is tough. It felt good to have the last laugh and to finish off like a champion." Eagle running back jay Ajayi reaches the ball over the goal line to score a touchdown against the Falcons. Whether Ajayi will remain with the Eagles beyond this season, once his rookie contract is scheduled to expire, is an open question. His productivity and that championship have not changed the reality of the modern NFL: Running back is not as highly valued a position as, say, quarterback or left tackle. And the Eagles already have shown last season (with Ajayi, LeGarrette Blount and Corey Clement) and this season (with Ajayi, Clement and Darren Sproles) that they prefer a by-committee approach at running back, which suggests that they're reluctant to overpay anyone, Ajayi included. "I'm not getting stuck on what might happen, because from my personal history already, anything can happen. Regardless, I know I have to play well to be able to get what I want." He's already gotten what he wanted, in a way. He's been out of limbo for close to a year, and everything is much quieter. Just ask him, then listen closely.